This is a great Philips Hue bundle deal if ever we saw one. That's because over at Currys for a limited time you can pick up the Philips Hue White and Ambience Colour Starter Kit and a Google Home Mini smart hub and speaker for only £84.99. Normally the Philips Hue White and Ambience Colour Starter Kit retails on its own for well over a ton, so the fact that you get it and a quality smart speaker too for far less really has set our bargain bells ringing. As can be seen in the full details of the deal below, you can also bag the deal with either the Charcoal or Chalk variants of the Mini, as well as either screw or bayonet light bulb fittings. Check it out now, thank us later. 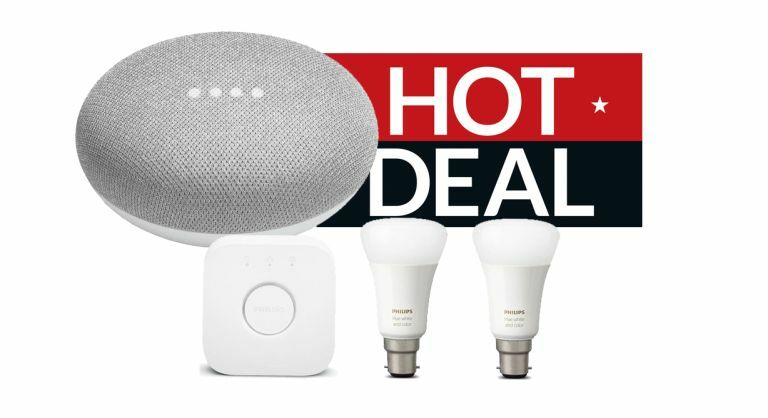 This bundle deal from Currys is a great way to kick start a smart home conversion project as it allows you to pick up the excellent Philips Hue White and Ambience Colour Starter Kit, which includes two smart bulbs and the Philips Bridge needed to control them, as well as a Google Home Mini smart hub and speaker, which can be used to active the lights via voice command. What we like most about this bundle is that the products included are absolutely quality, with Philips Hue smart bulbs like these lodged in the prestigious number one position in T3's best smart bulbs buying guide. Likewise, the Google Home Mini gets a great write-up in our best smart speakers buying guide, too. And if you are currently looking for even more smart products to fill your home with be sure to check out the best on the market in T3's authoritative best smart thermostat, best smart home gadgets, and best smart security camera buying guides, too. For even more top Philips Hue deals, be sure to check out T3's best Philips Hue deals roundup as well.